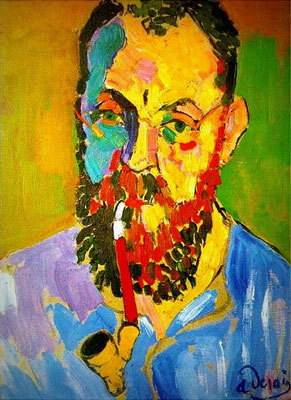 Henri-Émile-Benoît Matisse (31 December 1869 – 3 November 1954) was a French artist, known for both his use of color and his fluid and original draughtsmanship. He was a draughtsman, printmaker, and sculptor, but is known primarily as a painter. Matisse is commonly regarded, along with Pablo Picasso and Marcel Duchamp, as one of the three artists who helped to define the revolutionary developments in the plastic arts throughout the opening decades of the twentieth century, responsible for significant developments in painting and sculpture. Although he was initially labeled a Fauve (wild beast), by the 1920s he was increasingly hailed as an upholder of the classical tradition in French painting. His mastery of the expressive language of color and drawing, displayed in a body of work spanning over a half-century, won him recognition as a leading figure in modern art. Many of Matisse’s paintings from 1898 to 1901 make use of a Divisionist technique he adopted after reading Paul Signac’s essay, “D’Eugène Delacroix au Néo-impressionisme“. His paintings of 1902–03, a period of material hardship for the artist, are comparatively somber and reveal a preoccupation with form. Having made his first attempt at sculpture, a copy after Antoine-Louis Barye, in 1899, he devoted much of his energy to working in clay, completing The Slave in 1903.